Knee caps are made of waxed leather of 3.5-4 mm thick with simple brass rivets and burrs. They are fixed with leather belt with brass buckle. Knee caps are perfect addition to anatomical greaves. Please contact us at [email protected] to agree any changes you want to be done. Bracers with elbow caps are made of waxed leather 3.5-4 mm thick with simple brass rivets and burrs and are part of full arm protection in fantasy style. Elbow caps are being fastened with leather strings to the bracers. Bracers are fixed with leather belt with steel buckles on the arm. Scale pattern is tooled on the leather. Segmental spaulders and gorget will be perfect addition to the bracers. .. These spaulders are based on the armour of dwarf Thorin Oakenshield, one of the main character of "Hobbit". Spaulders are made of waxed leather 3.5-4 mm thick. They are fastened with leather strps to the mail and with leather belts with brass buckles to the upper part of arm. Pattern is tooled and painted with spray. Spaulders together with bracers of Thorin Oakenshield will make complete arm protection in fantasy style. ..
Anatomical greaves are made of waxed leather of 3.5-4 mm thick with simple brass rivets and burrs. They are fixed on the calf with leather belts with brass buckles. 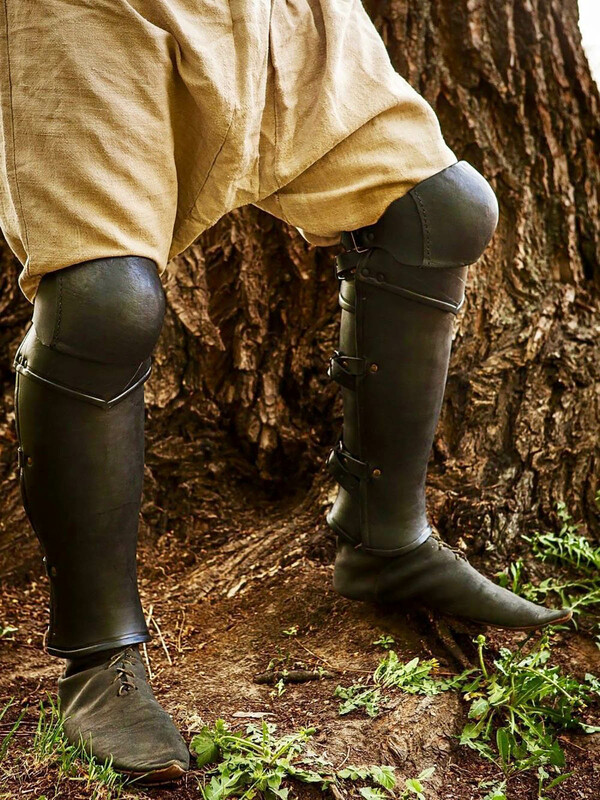 Leather knee caps of the same design will be perfect addition to this model of greaves. To agree any changes in the presented model, please contact us at [email protected] ..
Pouch for crossbow bolts is made of soft leather. There is magnetic clip for locking. Pouch is fixed on the belt with leather loop. Price is mentioned for one pouch. ..